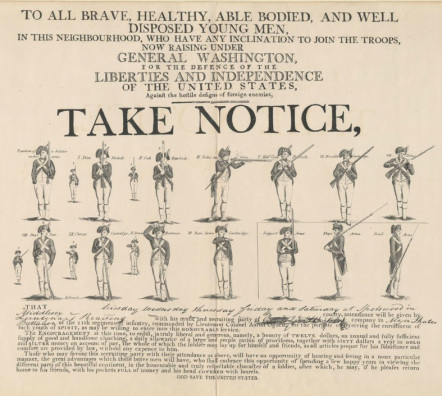 The Continental Army needs YOU! _The Second Regiment is constantly seeking new members who have a desire to accurately recreate the rich and exciting period of our nation's birth. We seek to recruit families as well as single men and women of good character. Membership as a soldier is open to any able-bodied male of at least 16 years of age. Musicians may be male or female of sufficient size to carry a fife or drum. All others may join the regimental distaff (support personnel). Minors must have parents as members or must have a regimental sponsor. The Second Regiment generally serves in the Carolinas and Virginia, with occasional visits further north. Members provide their own transportation to events, though most members frequently car pool. The regiment typically participates in 10-12 events per year, but members are not expected to attend every event. Members must attend at least 4 events per year to maintain active status within the regiment. Members are expected to obtain their personal gear within the first two years. While this is not inexpensive, the regiment will assist recruits in obtaining appropriate clothing and equipment as inexpensively as possible. Loaner clothing and gear is usually available for the use of new recruits upon request, if arrangements are made sufficiently in advance of the event. The cost of food for members is $15.00 per person per weekend (generally all Saturday meals and Sunday breakfast & lunch). Members portraying soldiers are expected to be in reasonably good physical condition, and able to physically carry out the duties of a soldier (marching, drilling, carrying equipment, light running, etc.). If you are interested in trying us out at one of the events listed on our calendar page, please fill out the Contact Form at the bottom of the page; a member of the unit will respond, answer any questions, and help arrange clothing and gear for your first event. After your first event, you will be given a membership application and access to the online Soldier's Book and Vendor List. _ A typical reenactment begins Friday night by setting up camp and dressing out. While the distaff prepares food, the soldiers train and prepare for the afternoon "battle". A battle can involve anywhere from 50 to 1200 men, depending on the event. The Regiment usually falls in as either Continental regular or light infantry, but we occasionally man our one of our two 6-pounder artillery pieces, and sometimes we fall in as Patriot militia in civilian clothes. Saturday evening is spent relaxing with friends and swapping old "war" stories. Sunday's schedule is the same, with camp breaking after the battle. Some events are living history shows, where we present various aspects of military life for the public without a battle reenactment.